Beto O’Rourke, Democratic presidential candidate from Texas, speaks at Pennsylvania State University as part of a multi-state campaign tour. STATE COLLEGE, Pa. — As Beto O’Rourke stood Tuesday amid a throng of students leading a “We Are! … Penn State!" chant in the student union, the former congressman showed the youthful energy that has rocketed him into the Democratic presidential primary. Yet even some of those Democrats intrigued by the 46-year-old on Tuesday were left wondering what he would do with that enthusiasm. The former Texas congressman’s speech before several hundred mostly liberal voters at Pennsylvania State University, like many in his early campaign, was heavy on applause lines and calls to a more unified America, yet light on policy. O’Rourke, who has stirred national attention and comparisons to the Kennedys with his lean looks and charisma, and who blew away rivals with a $6.1 million fund-raising haul on the first day of his campaign, arrived riding an early burst of momentum in the crowded primary field. A new CNN national poll Tuesday found him running fourth, with 11 percent. In staging an early visit to Pennsylvania, O’Rourke drew attention to the state’s importance. Though other states that vote earlier in the primary season will likely have more say in deciding the Democratic nominee, any candidates hoping to prove their general election viability need to show that they can win back swing states, such as Pennsylvania, that tipped to Donald Trump in 2016. O’Rourke’s stop was believed to be the first public event in the state by any of the Democrats officially running for president. Some people in the crowd saw a vigor that reminded them of another youthful candidate, Barack Obama, while others worried that beating Trump calls for a more substantive approach than the one offered by a former three-term congressman. Higgins supports Sen. Kirsten Gillibrand specifically because the New Yorker lacks the celebrity appeal of some of the other Democrats. But her friend Ronda Craig said she had put O’Rourke at the top of her list, hailing the energy he has stirred. “Having somebody that’s charismatic may be important,” said Craig, 46. In visiting Penn State, O’Rourke, who has become known for his upbeat persona and punk-rock past, seemed to be pairing his youthful image with his vows to reach beyond typical Democratic power centers. Centre County, home to Penn State and situated in a conservative region of Pennsylvania, supported Democrat Hillary Clinton by just 2.4 percentage points in 2016, although it voted much more heavily for Democrats for governor and U.S. Senate last year. O’Rourke, wearing a white Penn State cap with an open-collar shirt, said he would “campaign everywhere.” He reminded the audience that he visited all 254 Texas counties while running a close but unsuccessful campaign against Sen. Ted Cruz last year. “Wherever you are, whoever you voted for last time for president … I do not care. All that matters now is that we are Americans, we are human beings, and we have the opportunity to meet the greatest challenge of this country’s history,” he said. His visit came amid a swing that began in Iowa and took O’Rourke through Ohio, Wisconsin, and Michigan, all key swing states, with a message that has mostly avoided the liberal promises that have defined other high-profile contenders. Stewart said the contenders will have to show staying power. In Texas, O’Rourke was known for an unscripted approach, and Tuesday’s event was pulled together on short notice, with local Democrats learning about it only Sunday. His initial swing came as many Democrats anticipate a campaign launch from former Vice President Joe Biden, who has emphasized his own centrist appeal to middle-class voters in his native Pennsylvania and the Upper Midwest. O’Rourke presents centrism with a younger face. 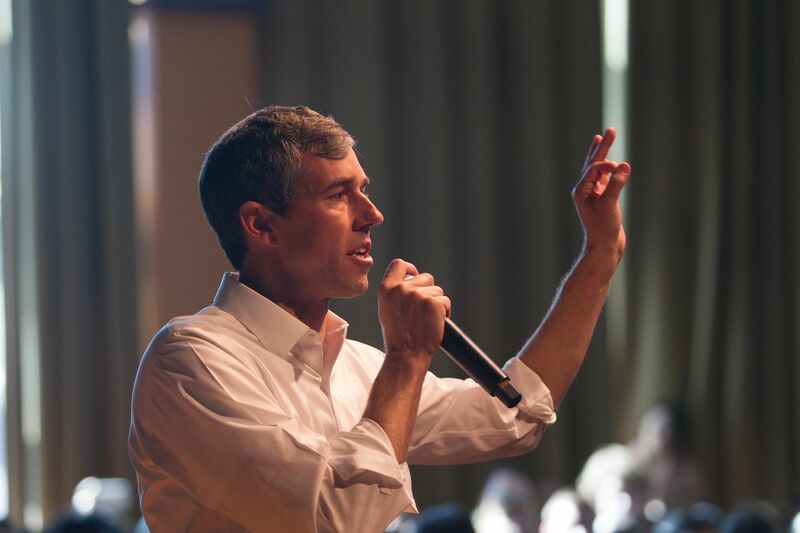 In a propulsive cadence Tuesday, O’Rourke railed against economic inequality, climate change, the opioid crisis, and the treatment of undocumented immigrants. He pointed to the recent college cheating scandal as an example of drastic inequality affecting opportunity. “We have fellow Americans who have an extra three or four million dollars which they can use to game the college admissions process … and there are families of kids who can’t put together $300 or $400 to be able to go to this university,” he said. For many in the audience, calls for unity and a better style of politics were what they wanted. “When I see him speak, I think of Obama,” said Theresa Cummins, a 57-year-old mortgage broker. “He’s well-spoken and kind, and I think we need more of that in our country,” said Amanda Green, a 22-year-old in her fifth year of college, who viewed O’Rourke’s Instagram account as the event began. O’Rourke mentioned support for legalizing marijuana and a Medicare buy-in program proposed by congressional Democrats. But mostly he decried problems without stressing specific solutions. Evelyn Ripley, 65, said she would be skeptical of anyone who claimed to have all the answers. As she watched O’Rourke drive away at the wheel of his minivan, Ripley said she was “impressed by his energy” and the fact that he wasn’t making big promises he can’t keep. “He’s on the same fact-finding mission that I am,” she said.